The chapter I quoted above, “The Perennial Retainers,” is about the jackdaws in the eaves of his mansion in Altenberg, and is the most emotionally powerful chapter, because of Lorenz’s intense and life-long love for these complex birds. My other favorite chapter deals with his painstaking care and observations of a litter of minute, high-maintenance water shrews. Given that water shrews are nearly blind, Lorenz’s extensive consideration of their navigational abilities is particularly fascinating. Lorenz also discusses the intricate ecologies of aquaria, the heritage of the domesticated dog (though I’m not sure whether all of his theories on this have held up under genetics), violence in animals (including humans), and the lives and behavior of dozens of other species, from waterfowl to the venomous, voracious larvae of the Dytiscus beetle. All of this is peppered with various hilarious anecdotes, frequently about the lengths to which he went in order to assure his animals’ well-being: e.g. scaling his roof while dressed up in a devil costume in order to relocate some jackdaw chicks without their parents learning his actual appearance, only to be spotted, crouching on the rooftop, by a crowd of terrified villagers. I was occasionally uncomfortable with the degree of anthropomorphism that creeps in, but generally Lorenz resists inappropriate anthropomorphizing, and indeed makes numerous incisive observations about the ways in which humans are prone to misinterpreting animal behavior and intelligence because of their propensity for anthropocentrism. Anyway, it’s hard to begrudge what here reads as the inevitable product of decades of intent study and deep appreciation, rather than as uninformed sentimentality. 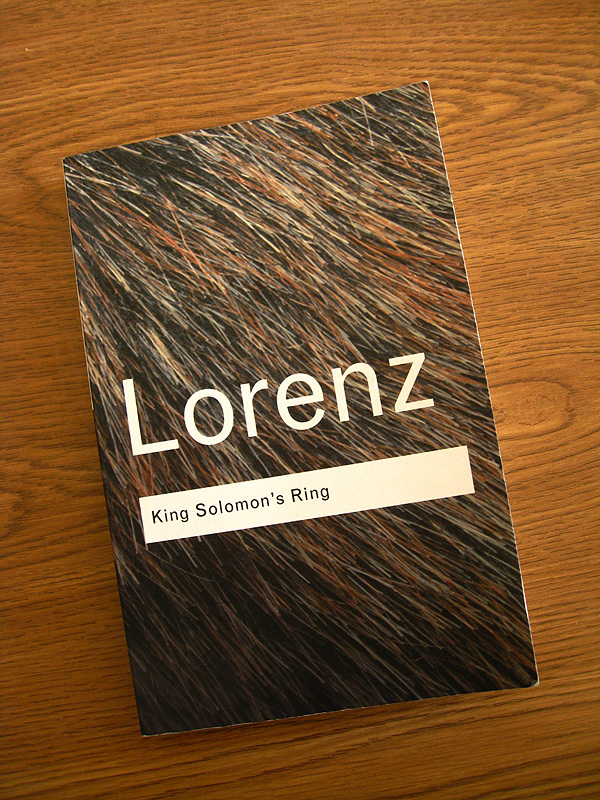 King Solomon’s Ring is, above all, a work of love; it’s a mind- and soul-feeding kind of book. Also, I’m in love with the cover design of this edition, which also includes Lorenz’s amusing original illustrations (which I stupidly forgot to take pictures of). I got lost in those excerpts, and not the good kind of lost, the “my world is being engulf by flowery adjectives and commans” lost. I’d have to read this short bursts. I will agree, the minimalist cover jacket is very well done. Most of the writing isn’t this effusive; I just picked this section because I couldn’t find anything easier to quote, since the impact of a lot of the other sections is contingent on a lot more information. Possibly that was miscalculated, as most of his writing is really clean and simple. Sorry for the adjective overload!